The Weather puppies are here! On December 21, 2013, SSD Scotia gave birth to five puppies, all yellow labs. We’re proud to announce SSD Doppler (male, orange collar), SSD Flurry (female, pink collar), SSD Fahrenheit (male, green collar), SSD Breeze (female, purple collar), and SSD Drizzle (female, teal collar). 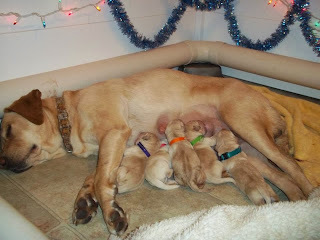 Scotia and her puppies are all healthy and doing very well. 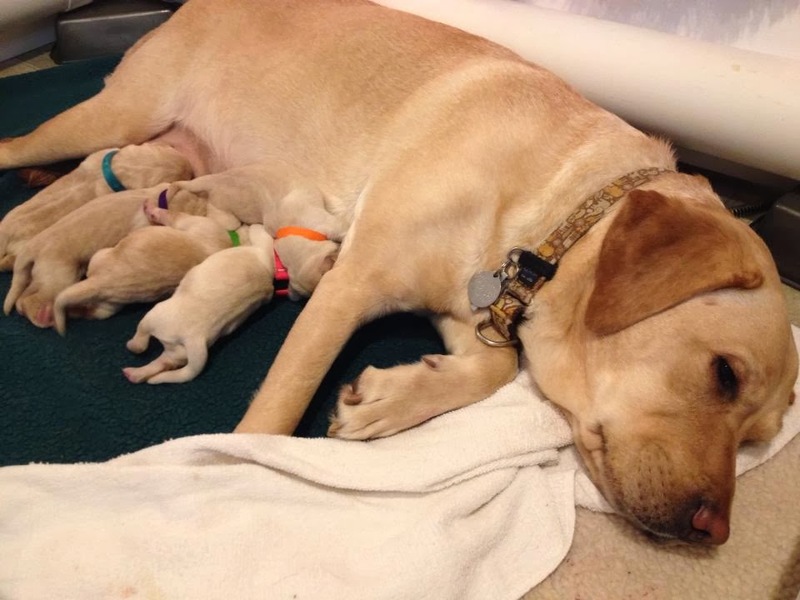 The pups are busy sleeping and filling their bellies—everything they need to grow. You can watch the Weather puppies on the puppy cam until they’re eight weeks old. Scotia settles in to her whelping box. It's warm and cozy, the perfect place to give birth to puppies. 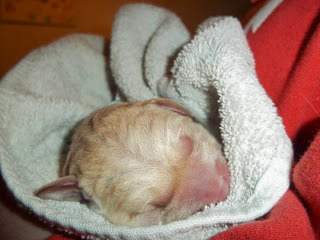 SSD Doppler was the first puppy born. Scotia rests while her five puppies nurse. The happy family--Scotia and her Weather puppies, Doppler, Flurry, Fahrenheit, Breeze, and Drizzle. Are your dogs joining in your holiday festivities? Here are some tips so you and your dogs have a good time celebrating. Dogs can get very curious whenever something new enters their environment, especially if it’s a tree with lots of lights, sparkling garland, and ornaments. Make sure your tree is secure so it doesn’t topple over if your dog bumps into it. You may want to hang treasured ornaments on the higher branches. Even if your dog tends to leave the tree alone, you never know when a wagging tail will knock an ornament off. Don’t let your dog drink the tree water, especially if you put any sort of fertilizer in it. Also, don’t let your dog eat pine needles or tinsel. Neither are digestible and could cut your dog’s digestive tract and require a vet visit. Holly, mistletoe, and poinsettia plants are all poisonous to dogs. If you absolutely must have them, make sure they’re out of reach of your dog. Most of our dogs are Labs, and we know that a Lab tail is capable of cleaning off a coffee table in one wagging swipe. Make sure you keep an eye on all lit candles, and if you have to leave the room, consider moving them out of tail-reach. If you set out dishes of candy, plates of cookies, or adult beverages, be sure to keep an eye on them. They can be tempting for dogs, and chocolate and alcohol can upset your dog’s stomach. Also keep an eye on any presents. 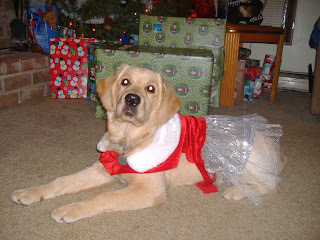 If your dog eats wrapping paper, ribbon, bows, etc., they could cause blockages that require a vet visit. If you’re planning on having guests over to your house, or if you’re taking your dog with you, it’s a good idea to practice calm greetings, especially if you have an SSD dog. Enlist a friend to help by knocking or ringing the doorbell like he or she is coming to visit. When they come inside, keep your dog’s attention on you by giving them lots of treats, one at a time. Only when they’re calm and have all four paws on the floor can they be greeted by visitors. If guests are going to be coming and going, it’s a good idea to make sure your dog is wearing a collar and I.D. tags. In the excitement and bustle of people arriving with bags of goodies, it’s not unheard-of for dogs to slip out the door. With all the excitement and stimulation during the holidays, dogs may need more water than usual. Make sure your dog has access to plenty of water, and if you notice your dog drinking more, be sure to take them out for potty breaks. All the hustle and bustle can be overwhelming for some dogs. Even if your dog seems to be handling everything well, they still may get tired sooner than usual. Give them a quiet place to go, whether it’s a crate or a dog bed. We hope your holidays are filled with joy! SSD Eva has been living in her new home with her new family in State College for a little over a week, after spending time with other puppy sitters. She will be staying with them for a while, and then she’ll move into her whelping home closer to Harrisburg. Eva is definitely settling in well. She has excellent manners and house behavior. At first, she was a little hesitant, but now she’s getting used to her sitters. 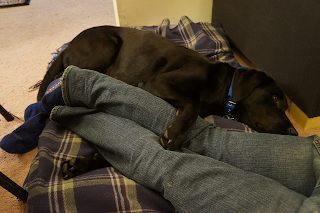 She’s still quite a “velcro” dog, but after a week of adjusting to the apartment, she has stopped waking up to follow her sitters whenever they leave the room. 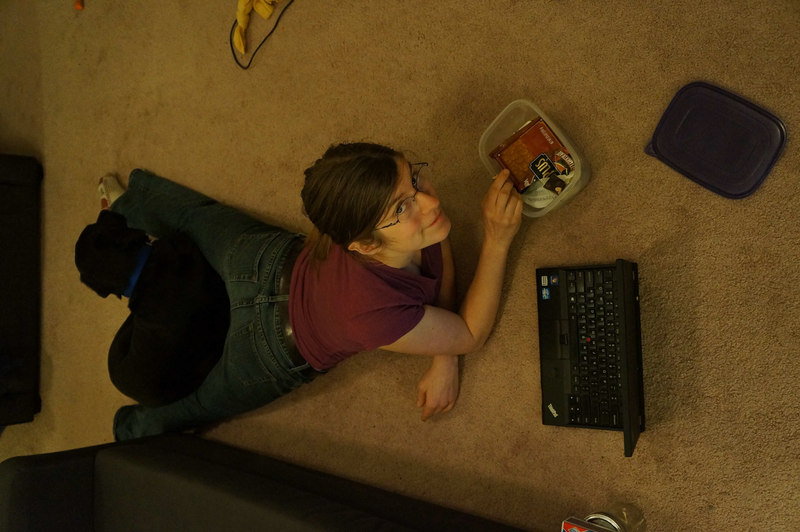 She loves to cuddle and will curl up at her sitters’ feet or anywhere close to them. 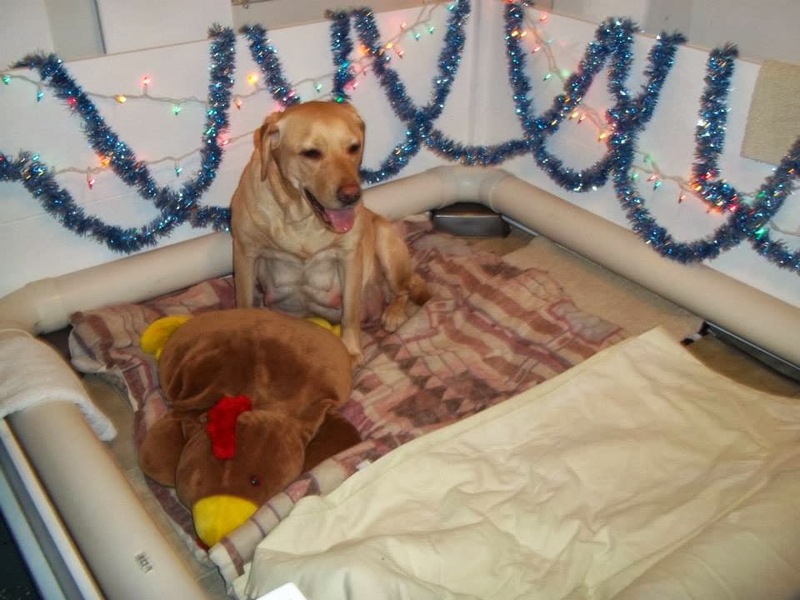 During her first few days, she thought she was supposed to sleep in bed with her sitters. Now, however, she knows the bedtime drill. They have a crate for her with a soft bed made out of a sheet stuffed with old clothes. Eva is very comfortable in her new bed—and she’s as reliable as an alarm clock in the morning. She wakes up her sitters every morning at 7 a.m. with a funny whine-grunt noise. Living in an apartment usually involves some adjustment for dogs. They need to get used to hearing the other occupants of the building. Right now, Eva barks at the dogs she sees out the window. She also barks when she hears the neighbors through the walls. Her puppy sitters are working with her on it. Monday through Friday, Eva’s puppy sitter Daisy takes her to work on campus. Eva is great at sleeping in her crate or under the desk. She seems to like the snow, but she doesn’t go crazy in it. Eva came from Guide Dogs of Queensland, and she was fully trained as a guide dog. 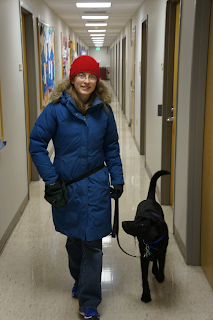 Service dog training is different than guide dog training, so Eva has some new things to learn. When she was walking with Daisy, she would scan ahead for obstacles, just like a guide dog is supposed to do. As a service dog, however, we want her to be checking in with her handler every so often. She’s learning quickly that she should watch the person with the treats. She and Daisy can usually walk all the way across the Penn State campus with the leash nice and loose. They’ve also been practicing walking up and down the stairs. Entering, exiting, and riding in an elevator is an important skill, too, so they’ve also been practicing that. Her sitters are getting her acquainted with clicker training and the cues that SSD uses. So far, she’s learning “go to bed,” “stand,” and “leave it.” She’s almost ready to put these behaviors on cue. Want to support SSD Eva? We're over halfway to meeting our goal to raise $3,300 for Eva. There are 21 days left. Will you help? You may have seen one—a fake service dog. They’re pets that have little to no formal training, let alone service dog training. But their owners wanted to take their dogs everywhere with them, so they hopped online, bought a service dog vest, and put it on their dog. Now their dog goes with them to stores, restaurants, movie theaters—everywhere. The dog may bark and whine in public, eat things off the floor, greet everyone they see, or worse, lunge at and bite people and legitimate service dogs. Because of the service dog vest, business owners don’t feel like they can ask the person to remove the dog. The whole experience makes business owners much less welcoming, and even hostile, toward legitimate service dog teams. People think it’s harmless to dress their pet dog in a service dog vest and go everywhere, but it’s not. It’s hurting real service dog teams. Sometimes it makes it impossible for the service dog to do its job, which can be life threatening to the dog’s person. At the very least, it adds unnecessary stress to people who need service dogs when business owners try to deny them access. Many people think that taking a service dog in public is a right, but it’s actually a law. Under the Americans with Disabilities Act (ADA), people who have service dogs can take them in public. A service dog can go anywhere the public can go. Under the ADA, service dogs are equivalent to medical equipment, and while we may not always like the analogy of comparing our dogs to equipment, the truth is that the dogs perform specific tasks to mitigate a person’s disability, much like medical equipment does. In fact, the dogs can often do tasks for a person that a sophisticated piece of medical equipment cannot do. For example, hearing dogs alert people to sounds in the environment, seizure response dogs can get help when their partner has a seizure, psychiatric service dogs can move in front of a veteran in a crowd to create space, and balance dogs can act as a counterbalance to help a person walk and prevent falls. Few people realize the amount of training that goes into a single service dog, nor do they realize the high expectations for behavior that are required of service dogs. When we’re working with our dogs in public, we often have people tell us that they think their dog would have made a good service dog. Many people think their dog could be a service dog because their dog is calm, listens to cues, and likes people or has “a connection” with a person. However, there is much more to it than that. 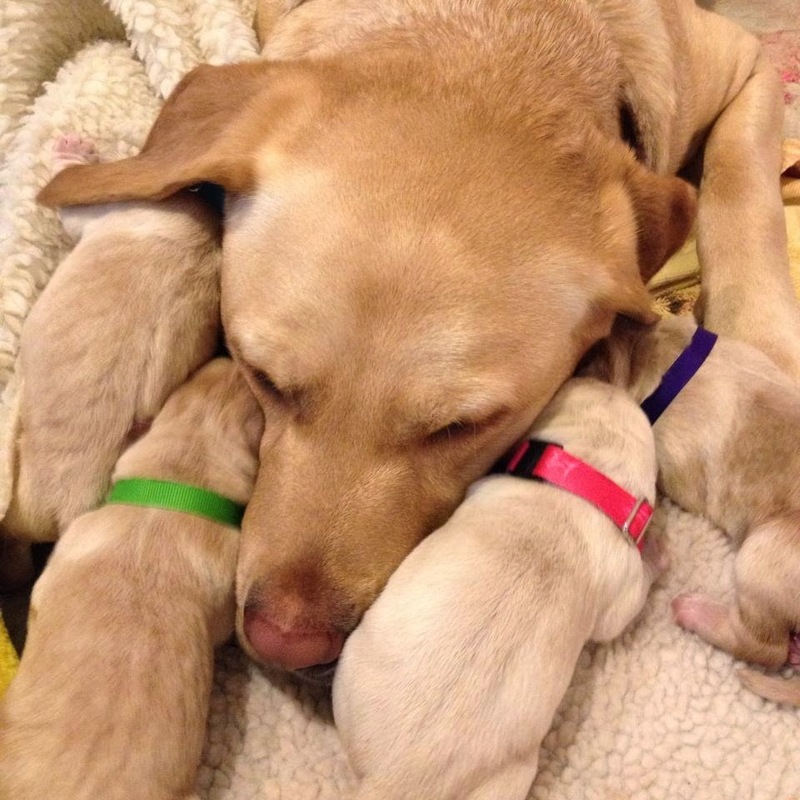 Within Susquehanna Service Dogs, training starts from the moment the puppies are born. The dogs are socialized, and taught self-control, good house manners, and a wide variety of cues. Once the dog has been trained by a volunteer puppy raiser for one and a half to two years, the dog comes to our kennel where our professional trainers take over the job of training the dogs. 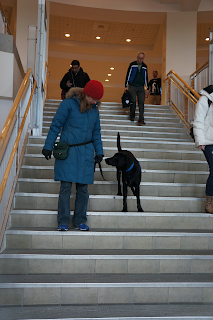 Each dog is matched with a person and then trained in specific tasks to mitigate that person’s disability. Few people realize that it takes approximately two and a half years of continual training before a service dog is ready to be placed with a person. And on top of the training, there are also health and temperament requirements. 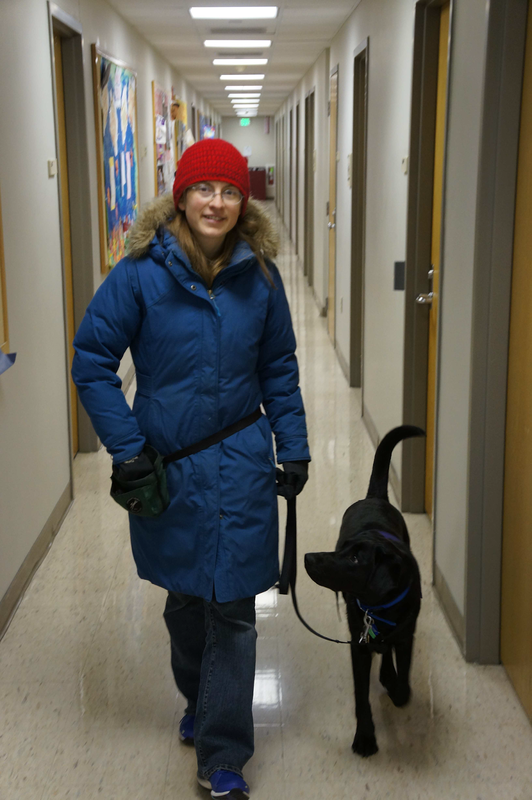 A working service dog can calmly handle going into almost any situation and environment. Ideally, other people should barely notice that the dog is there. For example, in a restaurant, the dog should go under the table and lay quietly. Other patrons should not even realize that there is a dog under the table. In all situations, the dog should be as unobtrusive as possible. Back when the ADA was being developed, advocates worked hard to make the law as broad as possible and to protect the privacy of people with disabilities. Under the current law, staff and other people are only allowed to ask a person with a service dog two questions: 1. Is the dog a service animal required because of a disability? and 2. What work or task has the dog been trained to perform? No certification or identification is required for service dogs, nor do they have to even wear a service dog harness. Because the law is so broad, it’s very easy (though illegal) for people to pass their pets off as service dogs. 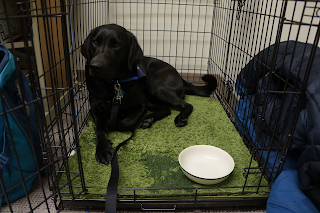 As fake service dogs become more of a problem, some people have suggested making the ADA more restrictive—requiring dogs to come from accredited organizations or requiring registration and certification for every service dog. However, we don’t see this as a viable solution. A more restrictive law would penalize people who have trained their own dogs. Because the dog doesn’t come from an accredited organization, they wouldn’t have public access, which would defeat the entire purpose of having a service dog. And requiring registration and certification would erect unnecessary barriers for people who are seeking independence. So, if we don’t want the law to change, what can we do to prevent the problem of fake service dogs from escalating? Education is important. People need to understand that every time they put a service dog harness on their pet, they are affecting the lives of people who truly need a service dog. Business owners also need to learn their rights with the ADA. A business can legally ask a person to remove their service dog if the dog is out of control and the handler doesn’t effectively take action to control the dog or if the dog is not housebroken. 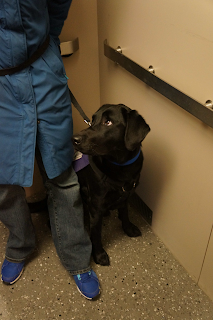 You can read the full ADA requirements for service animals here. If you know someone who tries to pass their pet off as a service dog, please let them know that their actions are hurting others. Please consider the cost to someone who truly needs a service dog by their side in order to have their independence.